AUDUSD – Forex trading crowds have aggressively bought into Australian Dollar weakness versus the US Dollar, and our contrarian trading systems have sold AUDUSD in anticipation of further declines. Trade Implications – AUDUSD: It remains a frustrating run of performance for our purely sentiment-driven Momentum2 strategy, as it has flipped direction on AUDUSD four times in the past three weeks. 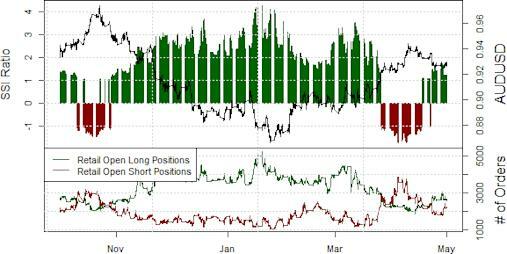 It is subsequently difficult to get excited about its current short position from $1.0244, but it’s clear that trading crowds have bought aggressively into recent weakness. The month of May has thus far proven kind to the US Dollar (ticker: USDOLLAR), and it seems relevant to wonder whether this is the start of a larger AUDUSD breakdown. Our Senior Technical Strategist believes that AUD-short positions remain attractive on the potential for said continuation. To receive the Speculative Sentiment Index and other reports from this author via e-mail, sign up for his distribution list via this link.